Steak & Stilton Pie: This is an indulgent, pungent and warming pie! 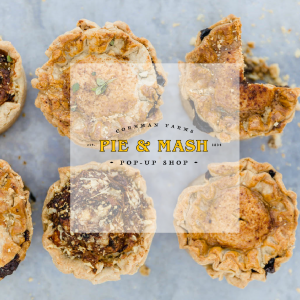 A stilton cheese and malty stout beer create a rich and textured filling making this is one of Britain’s (and Cornman Farms’) favorite pies. Mushy Peas: The real thing: these are actually yummy green lentils! This simple bright veggie is slow cooked with garlic and mint then mashed with butter and seasoned with salt and pepper. Double Cream Devon Fudge: Creamy and indulgent, this mouthwatering fudge recipe is from Kieron’s home town.